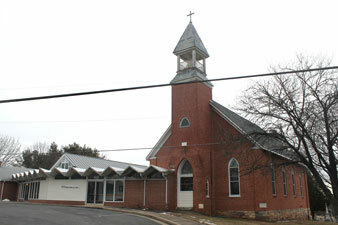 Faith United Church of Christ began as the German Evangelical Reformed congregation at a church at Bethel. This was a joint property of the Reformed and Lutheran congregation that was built in 1838. Over time, the church building became in bad condition and needed repair or renovation and about 1881, a movement was started to raise funds to do this jointly. The Reformed congregation then proposed to sell out its interest in the old building and erect a Reformed Church on a separate location. A joint congregational meeting was held and the Reformed congregation decided to give up its interest in the old church to the Lutheran congregation free of charge. The Bethel Reformed congregation decided to erect a new Reformed Church, more centrally located for the membership, where they might have a cemetery connected to it. Mr. and Mrs. William F. Zimmerman gave one-half acre of ground for the church and cemetery in nearby Charlesville, Work on the new church commenced in August 1881. The cornerstone of the new church was laid on September3, 1881 by the pastor, Rev. S. M. Hench. The name was changed to Zion Reformed Church of Charlesville. Construction on this church was completed and its dedication occurred on January 10, 1882. The new Zion Reformed Church building had been in use by its congregation for 21 years when on May 22, 1903, during a severe thunderstorm, the steeple was struck by lightning, set on fire and the building was consumed, leaving only the walls standing. A few days later, the walls fell as well. The church had no insurance on the building at the time. Almost immediately, a committee was formed and donations were made by church members and others for the rebuilding of Zion Reformed Church. Work to rebuild began in July 1903 and a dedication ceremony for the newly rebuilt church was held on May 29, 1904. This church continues to serve its community and in the mid-1900’s, its name was changed to Faith United Church of Christ.